The Sims Music NAMM Show Recap! Join us as we walk you through an entire week in California for the 2019 NAMM Show full of great music, amazing gear, and even better friends! A couple of days before the beginning of NAMM, we were lucky to get to go to Drum Workshop in Oxnard, California for the day. We got to hang with the staff, take a behind the scenes tour of the factory, and check out all of the great new product from DW, Gretsch, and LP! A highlight of this visit was when we got to hang with John Good (Co-Founder of DW) and hear him tell us the story about the new Pure Almond drum kits they are making. John said this is the hardest project he has ever worked on but that it is well worth the trouble. They are only making 50 kits from these almond trees and we are lucky enough to have one of them on the way to Sims! We actually are getting one of the first ones and the one that was used to present the series at the DW NAMM Show Booth! Take a look at this beauty and then prepare to see it at Sims within the next few weeks! In addition to the new drums, DW also released a few cool additions to their already legendary hardware line. One of the hot ones from the show was the reinvention of the DW 5000 Single Pedal! This is probably one of the most played pedals out there and DW has redesigned it and brought it back to life. They also added an extended footboard version of the 5000 pedal for 2019. One of the coolest hardware pieces we saw was actually their new kick drum mic mount! This mount just hooks onto the hoop of your bass drum and floats in the air. No more heavy kick drum mic boom stand to keep falling over at your gig and tearing your head! This new piece is going to be a hit! Towards the end of the day, we actually got to sneak away from the rest of the group and ride down the street to the LP Cajon Shop! This was definitely a highlight of the day. We have been carrying the LP Americana Series cajons for a while and they have always been some of our favorite. It was so cool to see this small group of guys working away on American Made cajons (and a lot of these cajons sell for under $200!) I (Justin) actually got to help LP design a limited edition American Series cajon last year and was able to meet the head builder that made that product possible. Check out this photo of lead builder, Josh, from LP. He started building cajons in his garage in North Carolina and did such a good job that LP found him, bought his company, and moved him to California to help design and build all of their cajons! We got a sneak peak at some amazing, limited cajons that will be coming out later this year so get ready to see them coming to Sims throughout the year! On Wednesday, we were invited to attend Zildjian’s Global Launch Event! This was a super cool experience, as we got to hear all of the product leaders at Zildjian and Vic Firth go over all of the new product and discuss their big picture plans for the brands and how they plan to help stores like Sims and all of the drummers out there in the world. Zildjian and Vic Firth had all kinds of great products come out this year, but there were a few that really caught our attention. First off, the new FX Stack from Zildjian. These are prebuilt cymbal stacks, at an affordable price, that allow you to set them up for different sounds with a proprietary Cymbolt designed just for Zildjian. Second, was the new Zildjian K Cluster Crash cymbals. These are somewhat of a spin off from the K Sweet Series that Zildjian released last year. These thin cymbals get their name from the random clusters of hammer marks on the cymbal, that help deliver a little trashier of a sound with a quicker decay. These, along with the fx stacks, are sure to be a hit and we are excited to already have them on sale at Sims! Come in soon and try them out. As for Vic Firth, the highlight of the show (and one of the hottest new products we have in store right now) was the new Freestyle series stick. This hot new stick is 17” in length and features double the size of the sweet spot on a stick, creating an incredibly balanced drumstick. You’ve got to come try them out. Everyone that picks them up just immediately loves them and can’t really even explain why! We are very excited to have the entire Freestyle line in stock! We had such a blast at this event are very grateful to have been invited. Come by soon and check out all of the great new gear from Z and Vic! Thursday was Day 1 of NAMM! May the crazy, loud, hectic weekend begin! What better way that to kickstart the weekend than with the launch of the brand new Taylor Grand Pacific Series?! We had gotten a little of secret info on this new guitar before the show but we had never seen or heard one of them before. And wow...they did not disappoint. This fresh new approach to the traditional dreadnought body shape is the perfect addition to the already stellar lineup at Taylor Guitars. We got to check out all of the new models and had our good friend Rhett Smith demo them for us. Check out these videos as Rhett talks over the new series and plays these amazing guitars. On top of the great new guitars coming this year from Taylor, they have also redesigned all of their Taylor Ware! They announced an amazing lineup of high quality guitar straps, polishes (including for satin finish guitars! ), Gotoh tuner sets, and more. We will have all of this headed our way very soon! We look forward to an amazing year with Taylor Guitars! Thursday was a day of huge announcements for a lot of companies and one of the biggest had to be at the Sabian booth! As soon as the show opened, Sabian hosted a press conference to announce their new logo and branding, as well as the redesigned AAX line of cymbals! Their new logo had to have been one of the most talked about things at the show! This fresh and bold new feel from Sabian is sure to turn some heads in the cymbal world. Sabian is continuing to evolve and grow as a company, and in recent years have really been pushing towards capturing and inspiring the younger market! They have been very supportive of our efforts at Freeway Music with supplies for teaching rooms, hosting clinics and educational events, and support for our showcases. This new logo and brand feels to compliment how they function at Sabian, with a progressive and positive look towards the younger generation, all while maintaining a strong connection to the generations that have supported them for so many years. After visiting with Sabian we got to spend with our longtime friend and Ludwig rep Marc! Ludwig had all kinds of great products at the booth and an awesome vibe with customers drooling over everything. The highlight for us was the new snares celebrating Ludwig’s 110th Annviersary. We are excited to have some of these beautiful drums coming to the shop soon and are taking pre orders on these now! Ludwig has always been an industry leader in snare drums (and kits) and their booth showed that they continue to be on top of their game. After Ludwig, Marc took us over to check out a new percussion line from a cool company called KEO. These percussion instruments are all made from the leftover wood from drum shells from Britsh Drum Company. They sound great and have cool look, due to their recycled origin. We hope to have these in the shop within the next month! As you can imagine, Fender’s announcement of the new American Acoustasonic Telecaster was one of the biggest talking points around the NAMM Show. Fender came close to stealing the show with this new product release. Over the last few years, Fender has been the hottest guitar brand in the world, but that did not stop them from pushing the limits. With this guitar, Fender has created an extremely versatile guitar for players looking to have top quality electric and acoustic sounds in one instrument. The following description from Fender just about says it all: “From acoustic shape-shifting to electric rhythm tones, this powerful guitar uses a revolutionary Fender and Fishman-designed Acoustic Engine to deliver new sonic expression from the studio to the stage.” The guitar features mahogany back and sides, an ebony fingerboard (the best), and amazing electronics to create an amazing sounding and playing guitar. We were lucky to already get 4 in the store (only 1 left as I write this) and are waiting on a couple more to hopefully arrive within the next month or so. Since getting back from NAMM, we have had electric and acoustic players in the shop to try the Acoustasonic Tele out and everyone has been blown away! Hurry in soon to try one out! Time to head to PRS! One of the most sought after guitars in 2018 was the new PRS Silver Sky John Mayer Signature model. When we received our first one, it sold within 20 minutes. Paul Reed Smith and John Mayer worked together for a long time to create one of the most amazing guitars to come to market in a very long time. At first, the internet mocked the guitar calling it a strat with a PRS headstock, but this opinion quickly changed once people starting learning more and getting their hands on them. We are excited that we finally received 2 more just a couple weeks ago. Because of the success of this guitar, Paul and John (Smith and Mayer, not McCartney and Lennon ;) ) decided to use the momentum to keep growing the line. At the NAMM Show, they announced the addition of 4 new colors for the Silver Sky, each blowing everyone away. The new colors are Orion Green, Frost, Golden Mesa, and Dogem Blue. Each of them looked amazing...so we ordered all 4 for the shop! We are expecting them around March and are currently taking pre orders. As excited as we were about seeing the guitars that were designed by John Mayer, we were even more excited about what was to follow...John Mayer himself! This was an amazing experience! I (Justin Sims) am a HUGE John Mayer fan and have been influenced by his music (and the musicians that perform with him) for many years, so getting to meet him and hear him speak about his custom guitar, was a dream come true. Dad (Jerry) also got to meet him, which was cool as they are both former guitar students from Berklee College of Music. We will let the masses decide which guitar player is better! (My vote goes to Dad). We were so grateful that John took the time to hang with some of us dealers and share his time. He was extremely friendly to everyone there and made it a point to take photos with everyone in the room. Its so great for the music industry to have a rock star like John out there, creating and inspiring, making music and our industry stronger. Aside from the new Silver Sky colors (which were obviously the talk of the NAMM Booth), PRS released a lot of awesome guitars this year, including Paul’s guitar and the new Ziricote SE model. We are excited to have Paul’s guitar on order and we already have a couple of the Ziricote in stock! Over the last few years, Paul Reed Smith guitars have been climbing their way to the top and we believe it's safe to say that they have become an industry leader with the likes of brands such as Fender and Gibson. We plan to continue to invest in PRS, as they continue to bring the best product at every price point for customers of all levels and styles! Time to head to Pedal Land! Later in the day on Friday, we made our rounds checking out all of the amazing pedal companies at NAMM. Over the last few years, the pedal companies have continued to push the limits and bring guitar players more and more sounds and inspiration, and this year was no different. At Sims, we have really been trying to grow our department so that we can provide the absolute best pedals to our customers. In the last 2 years we have added great brands such as Strymon, JHS, Walrus Audio, and Wampler. This year, we are extremely excited to announce another addition to the Sims pedal department...Earthquaker Devices! We went and spent some time at their booth and had a great time chatting with their crew and checking out the gear. It took us all of 2 minutes to decide that we wanted to become official EQD dealers! We will have a great selection of Earthquaker Devices at the shop within the next few weeks. As we grow the selection, we welcome any input from our customers on particular models that would be a nice addition. Keep an eye out for the official announcement once the pedals land at Sims! We made sure to go by and visit with one of our favorite pedal companies (and local heroes in our eyes)...Caroline! It was so great to see all the familiar faces of our Columbia friends out in Anaheim. Philippe and his crew have been continuously making a major name for themselves in the pedal world and we are so proud of them for representing Columbia so well. Caroline was giving everyone a little taste of 2 new pedals that will be launching later this year and we will let everyone know when pre order opens up, as these will sell out instantly. If you haven’t checked out Caroline pedals yet, be sure to go to our site and learn more or come in and demo yourself! Other highlights from Pedal world were definitely the new models from JHS and Strymon! The new Strymon Volante is already a favorite of everyone at Sims and we can’t wait for the JHS to arrive within the next week or so. As these companies continue to develop amazing products, we promise to continue bringing them to Columbia! So no one had more new product this year than Ibanez! Their booth was loaded full of all kinds of new models. From RG to Artcore to the SR basses, they are releasing new models and finishes in just about every series. After checking out (and ordering) the electrics, we made our way into their acoustic room. We were extremely excited to see the new additions to the Ibanez acoustic lineup and couldn’t wait to get them ordered for the shop! They have worked very hard to make wide selection of great looking, sounding, and playing guitars (and ukuleles) that all are priced under $500. We should see these great, new models start to arrive at Sims around the middle of February and we can’t wait for you to see them. ...we finally got to get upstairs to the Gibson booth! Obviously, Gibson has been a national headline for the last year or so due to some financial issues within the company. While a lot of the news was aimed at Gibson guitars, the company’s trouble was actually due to other brands and departments owned and controlled by Gibson. But because of this bad press, it was a necessity that they make a big splash at the NAMM Show and wow...did they deliver?! At 10am (when the show opens), their booth was immediately filled with people just walking around drooling over all of the new models! They had by far the hippest and most exciting booth at the entire NAMM Show. With workstations with real Gibson techs working on different stages of the guitar’s construction for spectators to visit, to live rock n’ roll performed all day, to the amazing display of Custom Shop ‘59 Les Pauls, Gibson knocked it out of the park. In 2019, Gibson will be releasing new models ranging from LP Juniors to Les Pauls and SGs in Standard and Modern Standard series, with a variety of ‘50s and 60’s necks. We were very excited to see Gibson getting back to their roots and creating new and improved versions of the guitars that changed music forever many decades ago. We got to spend some good time with our friends at Gibson and they are already working on hosting a very special event at Sims in the middle of the year, as we begin the celebration for our 40th Anniversary of business! Get ready for an exciting year from Gibson full of great models at all price points for all players. After wandering around at a variety of booths on Saturday afternoon, we headed back over to drum land! Imagine 2 football fields full of drums and cymbals, all being played as loud as possible at all different tempos! I know...it sounds like hell on earth, but in the spirit of NAMM...it was awesome! The drum industry is thriving right now with some amazing, smaller companies that have become leading companies thanks to the help of great product and great use of social media. While the bigger names in the industry continue to be leaders and innovators, it has been great to see companies use Instagram and Facebook to work closely with drummers around the world develop products that fill voids in drummer’s musical lives. A handful of these companies that are a major part of this ‘movement’ are Low Boy Beaters, Tackle Instrument Supply, and Big Fat Snare Drum. We got to meet the guys from Low Boy and Tackle at last year’s NAMM and its been fantastic having their product in the shop. If you haven’t seen their cool products, check them out on our site or in the shop. As for Big Fat Snare Drum, we were lucky to be one of the first stores in the country to carry their full lineup and for several years straight, they have continued to be one of the hottest products out there. We’ve got all of their gear in stock now! It was great to get to go by these drum company booths, as well as many others, and hear about how they are all working so hard to continue to grow and help drummers. While there may be millions of drummers out there, all over the world, it still feels like a small community, thanks to brands and people like those hanging out in drum land! On Sunday, we finally got a chance to head back upstairs and visit with Marshall Amplification! The Marshall booth was full of all kinds of incredible amps including the new Studio Classic, Studio Vintage, and Studio Jubilee. These are all amazing sounding (and looking) amps that are sure to turn heads in the industry. Marshall was obviously a pioneer in the amp world and its so great to see them continuing to innovate and modernize their products. Last year they brought out the Origin Series (some of our favorites in the shop) and this year they continued to raise the bar. Come in to learn more about the new amps and get your place in line, as these are going to be hot sellers all over the country! Later on Sunday, we went over to check out what was new from Tama Drums! Tama has always been one of our favorite brands at Sims and created the number one selling kit in the history of our shop in the Imperial Star Series. WIth this being said, we were very excited to see some amazing new finishes for the Imperial Star. They have redesigned a handful of fan favorites such as the Hairline Black and Hairline Blue, but our favorite was the new Black Oak Wrap (pictured). It is hard to believe they can make such a nice kit, complete with hardware and cymbals for under $800 but they continue to do it! This kit is perfect for intermediate players, churches, or even a casual gigging drummer looking for a quality kit at an affordable price. We are anxiously awaiting these new finishes to arrive and can’t wait to share them with you. In addition to the Imperial Star Series, we also checked out the Superstar Classic kits (coming soon) and some awesome new snare drums. We placed an order for a lot of cool Tama gear so get ready! Sunday afternoon we got to go spend some time at the Martin Guitar booth and checked out all of their incredible new guitars for 2019. They have announced a handful of different models in the Road Series, which are beautiful guitars made at their factory in Mexico, that feature solid woods, full gloss, and really nice hardshell cases. Last years models were a hit at Sims and we know these upgraded additions to the lineup will bring an even better value to players looking for Martin quality but at a more affordable price! There was an overwhelming amount of amazing guitars at the Martin booth but the highlight had to be the brand new Modern Deluxe Series. We heard a little bit of information about this series the week before the NAMM Show and we couldn’t wait to get our hands on them. This new series includes 4 models: 000-28, 0M-28, D-18, and D-28. The D-18 will come with mahogany back and sides while the other models will come with rosewood back in sides. All the models have a torrefied sitka spruce top with adirondack spruce bracing and several brand new features from Martin including a carbon fiber bridge plate, and a new titanium truss rod, and liquid metal bridge pins. All of these new features lower the weight of the guitar, while raising the volume of these great sounding instruments. We got to spend a good bit of time playing through the lineup and we were blown away. Please give us a call or come see us to learn more about these models! 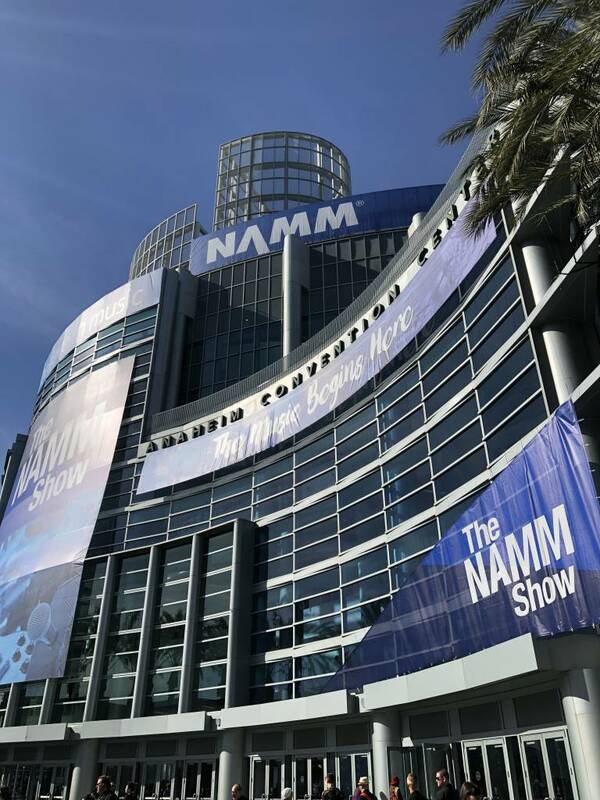 As you can see, the NAMM Show is full of amazing and innovative products and it would be impossible to try and share everything at the show with you, but I hope we have given you a closer look into the show that shapes the next year for musicians all over. In a world that sometimes seems to be ruled by huge online retailers and just a handful of powerful brands, it’s so great to see an industry like ours that is still thriving with companies of all sizes and brick and mortar retailers such as ourselves continuing to improve their customer’s experience. While all the gear and toys are awesome, the best thing about the NAMM Show is that it is a constant reminder of the most important part of our industry….you! It’s truly amazing to get to work with all of the amazing musicians in our local scene and others all over the country. Each one different in their own right, at different levels, playing different styles, but all coming together to be a part of something bigger than themselves. My family and I are forever grateful that you let us be a source of equipment and inspiration in your musical journey and we promise to always put forward our best effort and continue to improve your experience. Thank you so much for your support and we can’t wait to see you in Sims very soon!